Planning an itinerary for London that equally engages two teens, a tween, and two kids-at-heart meant tempering some of the more traditional sightseeing options (“seriously Mom, another church?”) with visits to more manga shops than you could have ever imagined existed. It also meant bookshops, candy shops, and some unexpectedly engaging adventures. In general, they loved to play “spot the cultural differences” and were somewhere between engaged and patient with the grown-ups’ interest in history and art. Lucas, at age 10, did comment at one point in Paris that maybe a little bit too much of our vacation had been about dead people. 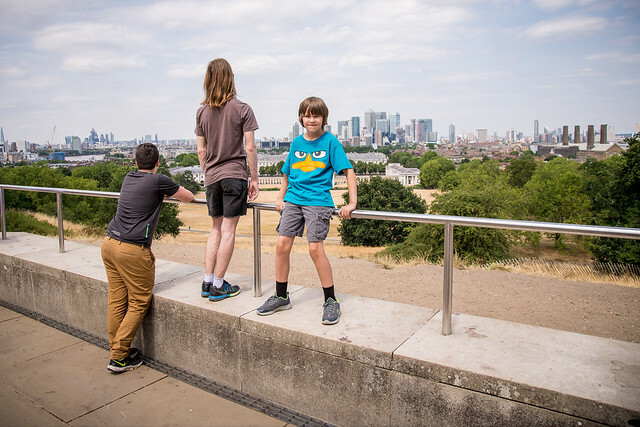 We used a LOT of pop culture and literary references to engage the boys in various activities, giving them meaningful context beyond the history books and top tourist attractions. Harry Potter, Les Miserables, the Beatles, Monty Python, Neil Gaiman, and Victor Hugo were but a few of the sources of our inspiration. This was my geek-out, and high on my list of things to see in London. The Royal Observatory at Greenwich, a UNESCO world heritage site, sits high on a hill (with a 60 degree incline for part of the climb!) a little bit east of the core. 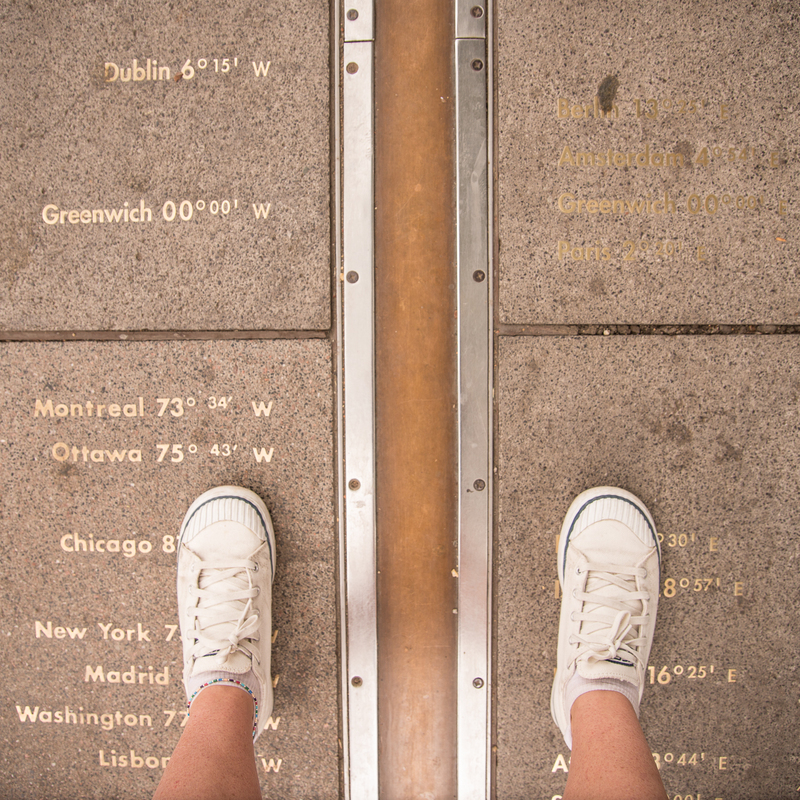 Not only did we learn the origins of Greenwich Mean Time, and admire some truly spectacular views out over London, but the boys were amused by the arbitrariness of standing with one foot in each hemisphere and the unresolved dispute over where exactly the Prime Meridian lies. If you’re at all interested in space or time, this is a very cool place to visit. There was an interesting looking retro market in Greenwich that I deeply regret we did not have time to explore — next time! 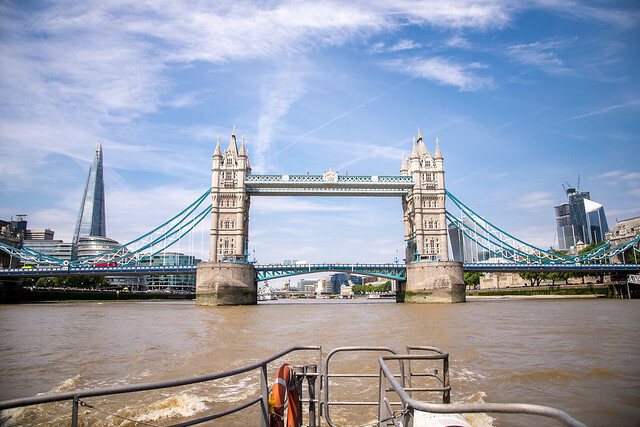 There are plenty of boat tours and cruises on the River Thames from which to choose. Because they are more for commuting than for tourists, the Thames Clippers are a simple and inexpensive way to see London from the Thames. There’s no commentary or tour guides, but we still loved our trip from Vauxall Bridge to Greenwich, with a change at London Bridge. If you use Google Maps, you can more or less figure out what you’re looking at as you go along. There is no better way to see the Tower Bridge than going under it, in our opinion! And, we could pay using our Oyster cards, buying a paper ticket for Lucas because he’s young enough to ride the Tube, buses and trams without fare and therefore did not have an Oyster card. I think we paid about £7 for the grownups for our one-way fare, and half that for the kids under 15. The ride on the Clipper came in second to the Harry Potter studio tour on my boys’ list of favourite London adventures! I’d started out incorporating all my Harry Potter thoughts here, but then they grew and expanded like someone had cast an engorgio spell on them, and they spilled out into not one but TWO separate blog posts, one on finding Harry Potter locations in London and the other on the Making of Harry Potter studio tour. Needless to say, I know few teens (nor Gen Xers!) 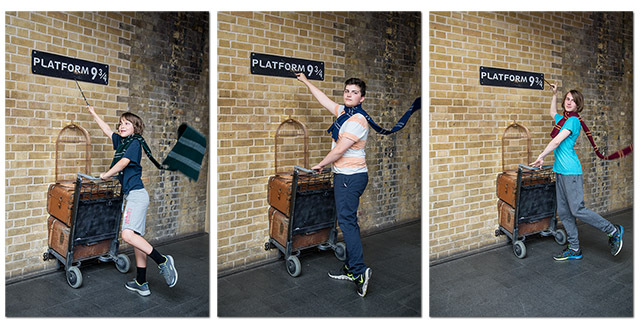 who wouldn’t love chasing down at least a little bit of Harry Potter while visiting London. This was the unexpected gem of our visit. We had time to kill on the morning of our visit to the Harry Potter studio tour, and hit the Camden Lock Market on a whim. I only wish we’d left ourselves much more time to explore this delightful warren of indie shops, crafters, vintage sales and commercial outlets with an alternative vibe. We had fantastic street food for lunch, and I got my very first (and long-coveted) pair of Doc Martens – authentic Made in England brand with gorgeous embroidered flowers to boot, erm, shoe. 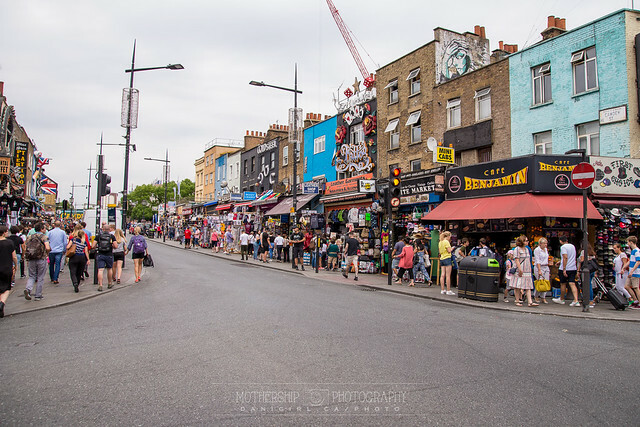 We approached the Market from the much more subdued Chalk Farm station side, and on the way out enjoyed the funky vibe of the main strip on the way back to the Camden Town Station. Even earlyish on a weekday morning, the place was alive with edgy energy – I can only imagine what it’s like on a Friday night! Wandering is hands-down my favourite way to explore, and there’s no shortage of amazing places to wander in London. We found ourselves drawn to the area around Covent Gardens, SoHo, the Strand and Trafalgar Square again and again during our visit. The pop culture megastore Forbidden Planet on Shaftsbury Avenue was a hit – I bought a paper copy of Good Omens to augment my ecopy, but we decided against hauling home the heavy tome that contained all the Monty Python scripts. Hardy’s Candy Store has sherbet lemons and lots of other sweets, along with the eclectic shops on Neal Street, and if you’ve got £299 to blow on a life-sized Firebolt of your very own, The Nobel Collection had lots of interesting toys for big kids! We were also sad that we couldn’t make the timing work on a Mudlarking adventure on the Thames foreshore or a graffiti street art tour and workshop in Shoreditch, both of which were on my kids’ want-to-do list and will simply have to wait until NEXT time. Care to add to the list? 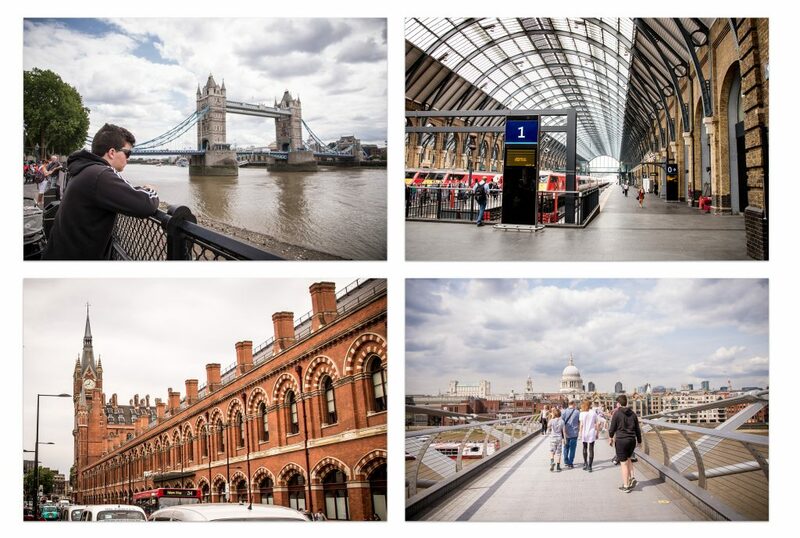 What places or adventures have your teens and tweens loved in London? 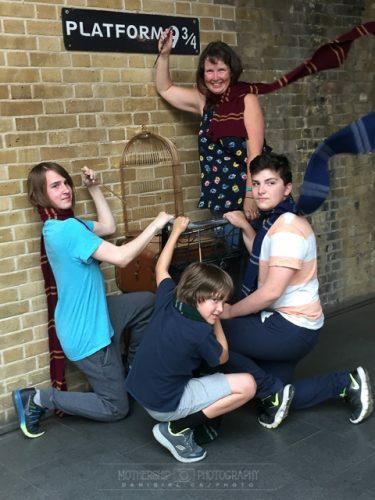 If there was a leitmotif for our trip to London, it was Harry Potter. I have spent the last year reading the books to Lucas for the first time (after having read them to the older boys several years ago, and of course reading each book several times by myself) and we broke our cardinal rule of “you must finish the book before you view the movie” to watch all eight of the movies before we left, even though we’re only midway through reading The Order of the Phoenix. All that to say, we were well marinated in Harry Potter lore heading into this trip, and we all five love the books and the movies. I have a whole separate blog post planned for our visit to the Making of Harry Potter studio tour, but even if you don’t opt for the tour, there is plenty of Harry Potter minutiae outside the Warner Bros. studio to enjoy. Here are a few of the places we enjoyed finding, either by specifically seeking them out or just recognizing them as we passed by, that have served as film locations in the eight movies of the Harry Potter franchise. A few days later, we found ourselves in Picadilly Circus, which was too noisy and crowded and busy for our tastes, but you might recognize it from Deathly Hallows Part One, where Hermione brings Ron and Harry to escape the Death Eater attack on the Weasley wedding. St Pancras station was our departure point, where we caught the Eurostar train to Paris. You’ll see its neo-gothic clock tower as Harry and Ron zoom past in Mr Weasley’s flying Ford Anglia in the beginning of The Chamber of Secrets. Diagon Alley has two muggle locations in London. The first is the Borough Market, where Harry pops off the Knight Bus in The Prisoner of Azkaban. 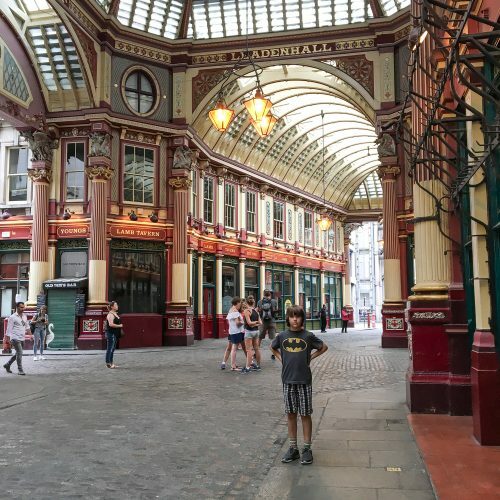 The second is Leadenhall Market, a gorgeous set of Victorian arcades that has been a functioning market since medieval times and also happens to serve as the entrance to the Leaky Cauldron in The Philosopher’s Stone. What we did not know is that Leadenhall Market, including all its cute shops AND restaurants and cafes, is closed on Sundays. It was still a fun place to explore, just not a great place to arrive hungry and hoping for a good spot for dinner on a Sunday. Platforms 9 and 10 (and, ostensibly, 9 3/4) are behind a barrier that you can only cross if you have a valid train ticket. 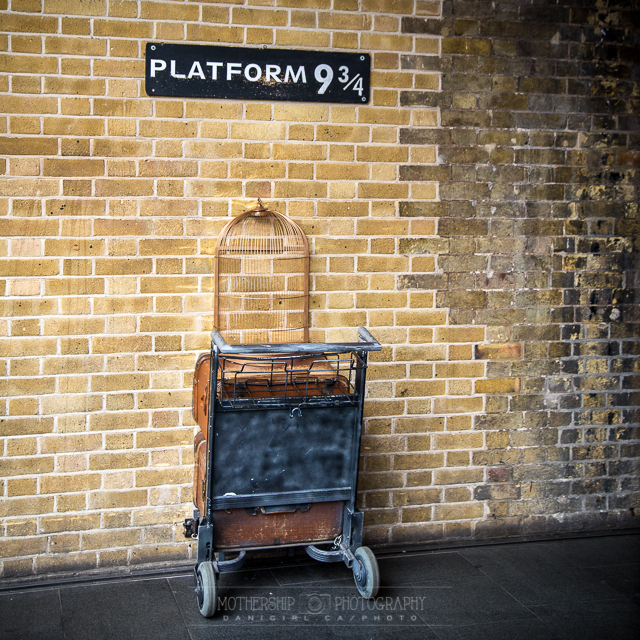 However, they have mocked up a more accessible Platform 9 3/4, complete with trolley passing through the brick wall and nearby gift shop, where fans can queue to have their photo taken. They even supply scarves in the Hogwarts house of your choice, and have employees standing by to manage the queue (and your scarf) and take photos. A staff member takes photos of everyone, but you are also welcome to take your own, and you are not obligated to buy the official version. We queued for nearly an hour but found the staff quite accommodating, letting us take individual photos of the boys, then a group photo of just the boys, and finally one with the boys and me in it. (Beloved preferred to remain on the safe side of the camera!) Pro tip: you can save yourself the bother of queuing up at King’s Cross if you’re planning a visit to the Warner Bros studio tour, as they have the same set-up but with poorer lighting and basically no line-ups. And even with all of that, there are Harry Potter film locations in London that we missed. If you remember Dudley and Harry encountering the snake in The Philosopher’s Stone, you’ll find the Reptile House at the London Zoo familiar. Scotland Place stands in for the Ministry of Magic and nearby Westminster Tube station was closed for an entire day when it was used as a location during the filming of The Order of the Phoenix. Though the movie shows the Leaky Cauldron as being accessed through Leadenhall Market, the books imply access off Charing Cross Road, and of course Diagon Alley is where one would see the imposing white marble of Gringotts, the wizard bank, but is better known to muggles as Australia House, the Australian high commission. There are, of course, no shortages of Harry Potter souvenirs available in what seemed like almost every retail establishment. We were unable to resist the attraction of wands for each boy, t-shirts and Pop figures with Harry Potter themes. And I’m positively delighted with my Marauders’ Map scarf, as I do solemnly swear that I’m up to no good. We managed to resist the full set of Professor Snape’s dress robes (£299!) or a life-sized Firebolt at nearly £500. 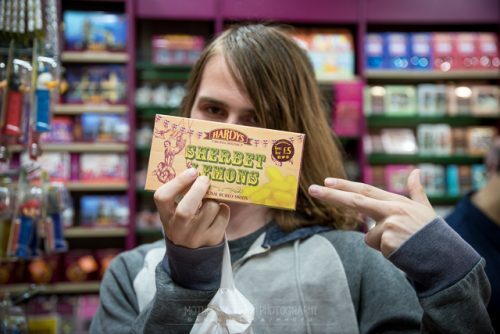 One of our less-traditional Harry Potter souvenirs came from a candy shop near Covent Garden where we found sherbet lemon drops. They’re Dumbledore’s favourites, you know! Make no mistake, we did not (entirely) reduce one of the world’s greatest cities to a giant Harry Potter scavenger hunt. We also learned about everything from Londinium to Henry VIII to the origins of Greenwich Mean Time. I have to tell you, though, nothing quite came close to the magic of London through a Harry Potter cinematic lens! 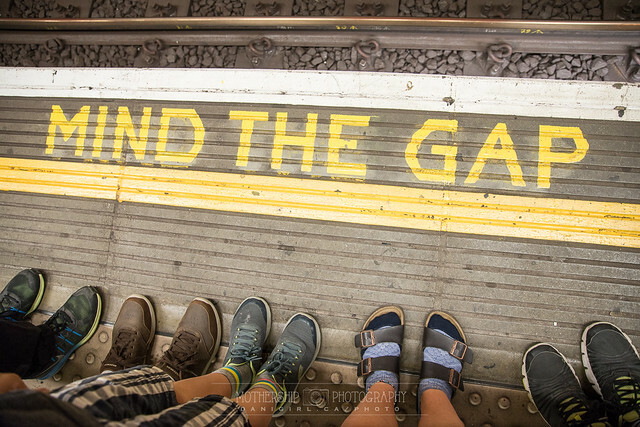 I would not have expected that navigating through London’s (in)famous Underground would be as significant a touchstone in our travel memories as were our trips to the Harry Potter studio, the Royal Observatory at Greenwich and the Tower Bridge. It was certainly something we were anticipating with interest, partly because Tristan, Simon and I read Neil Gaiman’s Neverwhere a few years ago, and many of the stations and places played a part in that story, and partly because the Underground is sort of mythic in pop culture in its own right. Certainly, it was both more interesting and less challenging than I had fretted in the planning portion of our adventure. The Oyster card, London’s smartcard system for paying fares for travel in the Tube, bus, light rail and some river boats, seemed fairly straightforward, but I still remain unclear on whether or when one should opt for a special travel card or a visitor Oyster card. I also could see that Simon would be able eligible for half-priced fares (ages 11 to 15), that at 16 Tristan would pay adult fares, and Lucas would generally travel free accompanied by a paying adult. There were myriad options for kids, though: youth Zip cards and travel cards and young visitor discounts and visitor passes; no matter how much I read, I could never quite parse the differences and benefits between them. In the end, we just used the regular pay as you go Oyster cards. I’d been told it was easy to both acquire the cards (you can get them from ATM-style machines in each Tube station) and to find a Transport for London (TfL) employee to activate a special youth discount on Simon’s card. 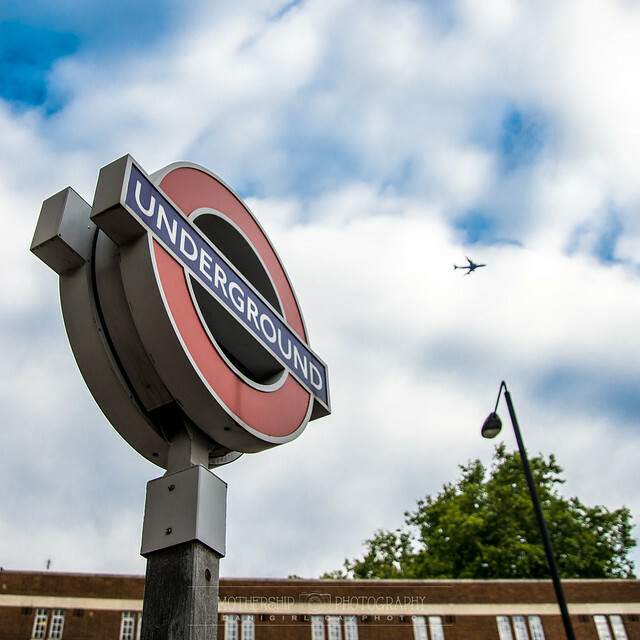 It was even easier than I expected – there were minimal lines at the machines at the Heathrow station, and there are universally helpful and patient TfL folks at every Tube station to help you figure out how to purchase, reload, or add a youth visitor discount to your card. In fact, if a certain youth manages to lose his newly acquired and pre-loaded with travel money Oyster card on the voyage between the airport and arriving at your flat in your first 90 minutes in London, the station attendant will good-naturedly chide said child as “quite naughty” and give you special sleeves for all of your family cards so that no more of them go astray. Soon, we were all pros at tapping in and out as we moved through various Underground stations. 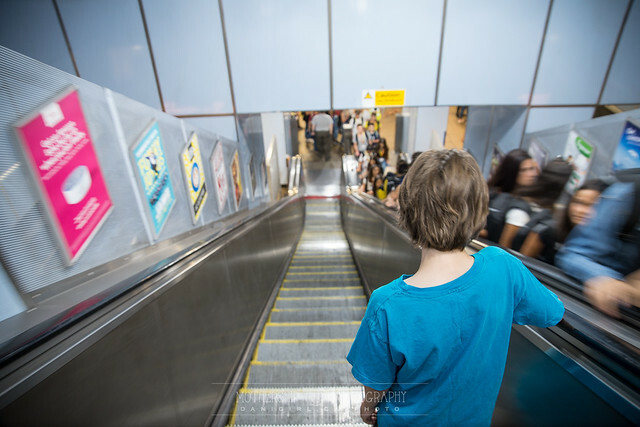 Lucas, who at age 10 travels for free with an adult, learned to look for the wider accessible gate with paddles rather than turnstiles at each barrier so we could move through together. I even showed the boys to watch for the quick flash of remaining balance on the Oyster cards as they tapped out. While I was a bus commuter for years in Ottawa, and while I’ve occasionally used subways in Toronto and Montreal and even Paris before, this was my first experience with extensive use of a subway system. I have a couple of observations. First, it is generally a stunningly effective system. I can see how it would be utter chaos when the system breaks down, but once you get the gist of it, the Underground is a safe, easy and efficient way to zoom around the core. We enjoyed the Tube even better when we learned to avoid the crush of rush hour congestion we accidentally got caught up in a few days in a row, before we learned to travel in off-peak hours. Second, I was surprised at how far one has to follow labyrinth tunnels up and down and over and up and down and over again to make a connection in what is purportedly the same station but occasionally feels like it’s in a different time zone. Third, London in general is not equipped for heat waves of the sort that gripped the city in July of 2018, and nowhere is this more evident than in the un-air-conditioned Underground. Several times we opted for walks of 30+ minutes on sore and tired feet rather than dealing with sweaty, crowded Tube rides of half that duration. Fourth, one does not mess with the rule that the right side of the escalator is for standing and the left is for moving. The fifth and final observation needs a paragraph of its own. The Transport for London trip planner is a great tool, with some caveats. Rather than downloading the app, I simply bookmarked the trip planner on the home screen on my phone, and used it constantly. Annoyingly, it clears your journey when your phone goes to sleep or you open a different app, so I got in the habit of screenshotting our planned routes – I realized only after deleting several days’ worth of them that those screen shots alone would have made a fun souvenir collage! And the trip planner defaults to the fastest journey, not necessarily the most convenient or even sensible, resulting in some suggested journeys that comprised a mash-up of Tube and bus options that were optimized by customizing the results to include only Tube options. In short, if you’re going to London for the first time and planning to use the trip planner (which I highly recommend) I also highly recommend that you play with the trip planner for a few days ahead of time so you get used to the options and quirks, I mean, features. Since we live on the rural outskirts of the city, the boys have not had a lot of exposure to public transit. And by “a lot” I mean pretty much any at all. By the time I was a teen, living in the smaller namesake London in Ontario, I was able to navigate from one end of the city to the other using transit, and I’ve often thought that one of these days I’m going to have to invest a day showing the boys the peccadilloes of OCTranspo. After seeing how quickly they learned to read the station placards to differentiate between east and westbound lines, following directional signs through endless tunnels and even coming to rely on their quick eyes to navigate busy stations, I have every confidence that they’ll be able to master the relatively simple Ottawa transit system. Using your debit card to top up the cards on the go is as easy as could be. We spent about £45 per adult for a week of travel, including extra for overground tickets to Hampton Court Palace, Watford Junction (Harry Potter studios) and a ride on the Thames Clipper commuter ferry. Here’s another tip for you. You’ll have to pay a £5 deposit when you purchase your Oyster cards from the automated machines at the station, but you get the deposit back and any unused funds up to a certain threshold (I think it’s £10) from the same machine – just look for one that says refunds are available. Just when I thought I was so clever, having spent the last of our British coins on snacks at St Pancras station waiting for the Eurostar, I found myself with nearly £50 more in coins after cashing out our Oyster card deposits and unused fares. More snacks, boys – a LOT of snacks, and quick before the train to Paris comes! 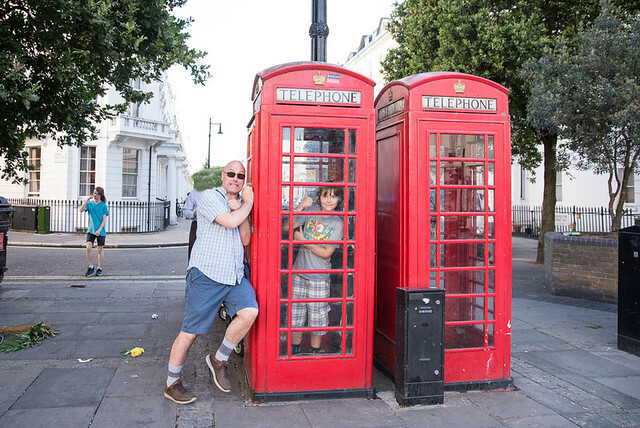 We’re freshly home from our epic two-week adventure in London and Paris, and I have SO MANY stories to tell you that I don’t even know where to begin. So, let’s start — at the beginning! Although I’d worked myself into a veritable lather of anxiety by the time our departure day arrived, the overnight flight from Ottawa to Heathrow went reasonably well. We had just enough trouble on departure and arrival to make for funny memories – like the pre-booked taxi that first arrived at 7:30 am instead of 7:30 pm, and the second taxi that arrived on time but did not have enough seatbelts for five people and could not (would not?) accept credit or debit card payments. All’s well that ends with an on-time arrival at the airport, and the credit card issue was merely foreshadowing for what was to come. 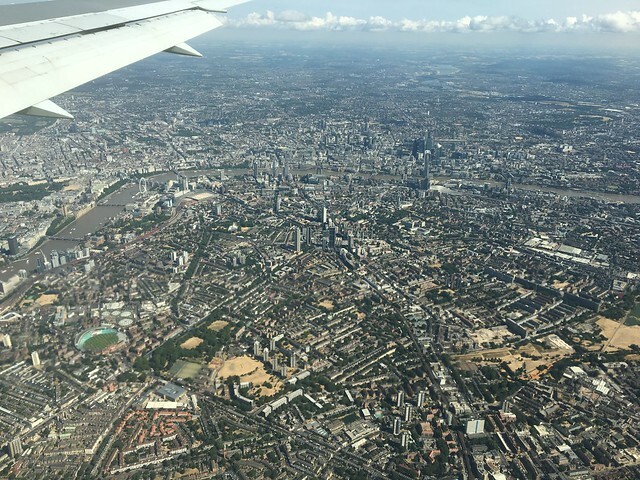 I knew that Heathrow was to the west of the city, so I was entirely unprepared to look down and see this picture-perfect view of the heart of London on our approach. 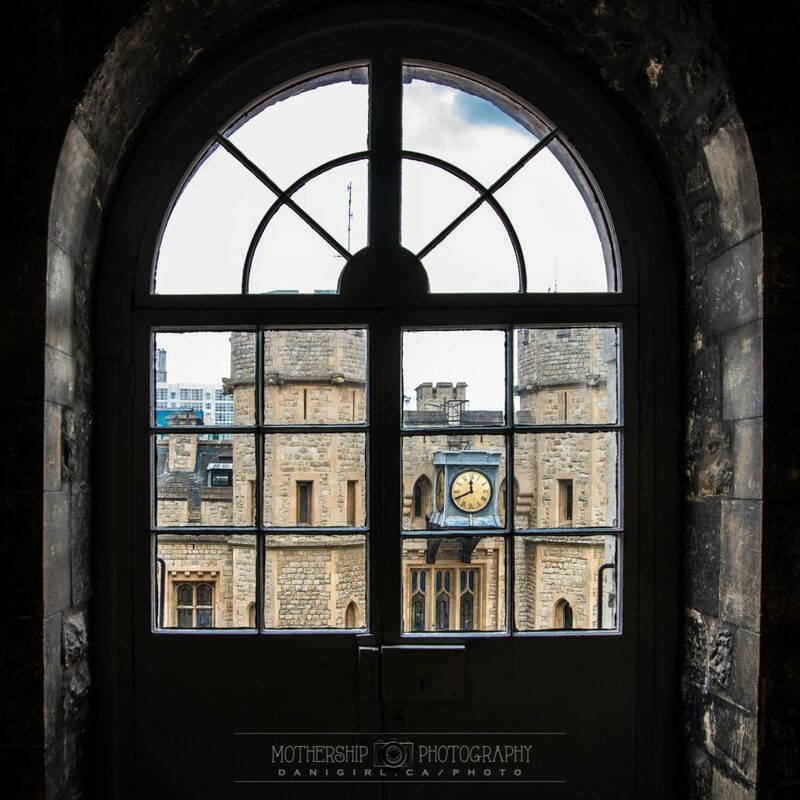 You can see the coffee-coloured loop of the Thames River, Westminster Abbey, the London Eye, the Tower of London and the Tower Bridge, the Shard, the commercial towers of the City — spectacular, and such a great introduction to the city. If you’re flying in, consider seats on the right side of the plane for a chance to see this extraordinary view. We got off to a bit of a shaky start when we could not get in contact with the property manager of the flat we’d rented. How to text or make local calls from a mobile phone was something that I’d assumed would be straightforward, and so was of course the one thing I didn’t research endlessly and also the one thing that caused us the most distress. My instructions were to text the property manager when we cleared customs at the airport, and he’d meet us at the flat. Except he didn’t respond to my texts, and my calls didn’t go through. I emailed the property owner through the rental service, and did not get a reply. We rode the Tube into the city, stopped for sandwiches none of us enjoyed at a local deli, and tramped morosely to the flat feeling increasingly dismayed. We were clustered on the porch, with me trying and failing to connect with the rental service and just about to fully panic that we’d been duped by some sophisticated rental scam when he appeared on the sidewalk in front of us. He’d been wondering why he hadn’t heard from us and thought he’d drop by the flat to see if we’d arrived. The flat was amazing. AMAZING! We chose Pimlico more or less by chance. 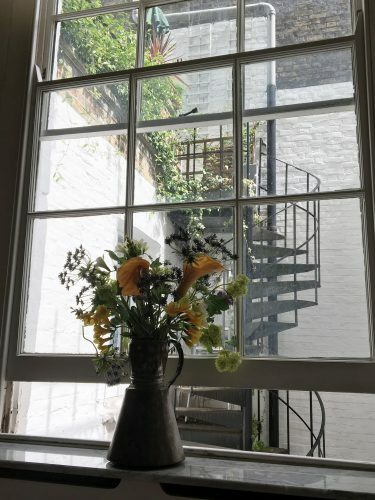 We were first going to go with an apartment outside the core areas in Walthamstow, and then we considered dual hotel rooms in a moderately inexpensive place in Bloomsbury. In the end, the flat was perfect for us – cramped to be sure, but we were really only there to sleep – and with just enough hints of luxury to make it feel like home. I can’t imagine ever staying in a hotel with the kids when staying in an actual home is an option. One of the main things we noticed is how not an inch of space goes to waste, like the dual washer-dryer combo machine and the footstool that doubled as an end table and excess toilet paper storage. You know what they didn’t have? Window screens. I never quite got used to the fact that windows were thrown open all day and night (poor London has been sweltering this summer) and bugs never seemed to be an issue. This is the view that greeted me when I opened my eyes each morning – so quirkily perfect! I’ve been planning this trip for 11 months. There were spreadsheets, annotated maps, and a teetering stack of travel books, to say nothing of websites, blogs and travel forums. On our first day in London, we had our priorities straight. 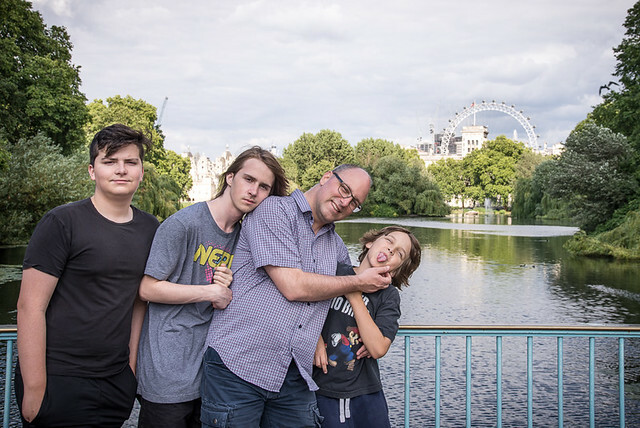 First, we visited St James Park, which was a lovely 20 minute wander from our flat, not to ogle nearby Buckingham Palace, but because it was referenced in one of my favourite books, Good Omens by Terry Pratchett and Neil Gaiman, that I had read aloud to Tristan and Simon last year. We admired the ducks, just as Crowley and Aziraphale had done, and the pelicans, too. St James Park would turn out to be a bit of a nexus for us – each day we wandered somewhere new, the most efficient walk home seemed to take us through St James Park again. Despite the grass being burnt nearly brown from the unrelenting heat this summer, it came to be one of our favourite places. I had a lot of things mapped out on my annotated maps – star tourist attractions, food and shopping, and key photo locations. 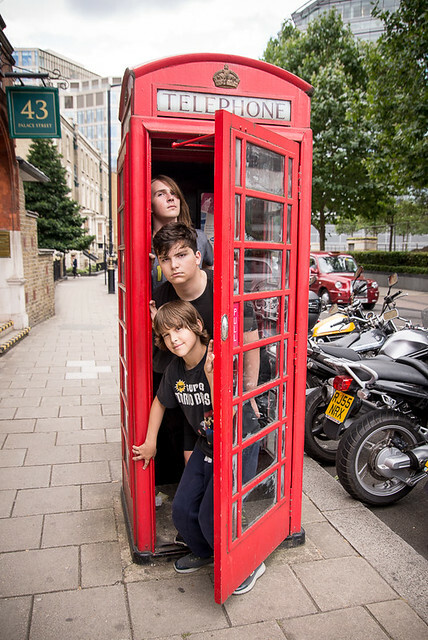 One layer of maps was dedicated to locations of the iconic red telephone boxes. I needn’t have made that particular effort, though – they were not hard to find. Lucas kept count, and we passed more than 50 of them in our wanders. 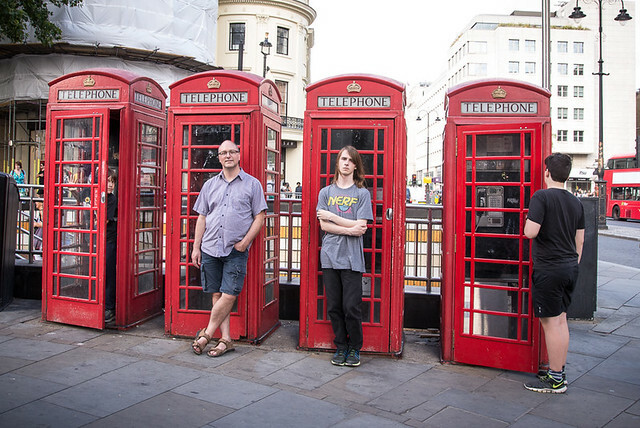 This set of four in a row was near Trafalgar Square, and was practically begging for me to take this photo. As I said, I’d actually mapped out maybe a dozen spots where the call boxes were located, and yet these ones were a mere block from our flat. This was our last night in London. So that’s how it starts. Stick around and I’ll tell you more, about Harry Potter and museums and Greenwich and markets and the Tube and parakeets and palaces and manga and fish and chips. There will be photos, and travel tips, and a self-deprecating anecdote or three. And then we’ll talk about Paris, too! Help me, sophisticated travels of the blogosphere! With two months left in the year-long adventure of planning our trip to London and Paris this summer, we’ve arrived at the time for some tough decisions. Today’s debate: carry-on versus checked luggage. I’m an inveterate over-packer. Nearly two decades of motherhood has made a good boy scout out of me; I like to be prepared. I’m also reasonably organized, and a pro at the jigsaw puzzle of fitting all the pieces we need into our mid-size car and rooftop luggage rack for a road trip. Airline travel, though, is a whole different ball of packing tape. On the one hand, I can see the merit of packing for carry-on only. It’s quicker, more streamlined, and nobody wants to lug a giant suitcase through the Tube, onto the EuroStar or through the RER in Paris. With carry-on bags, we don’t have to worry about bags going off on a different adventure (although with a non-stop outbound flight, I’m reasonably confident this is not much of a concern.) We could probably fit everything we need into five carry-on bags plus the personal bag you’re allowed to have on the flight. And the boys are getting to an age where managing their own bag is probably an important life skill. My first problem is that we don’t actually HAVE five carry-on bags. I think we have one, maybe two. The boys can use their school backpacks for their personal stuff, but I’d still need to beg, borrow or steal at least a couple more carry-on bags. Second, I think while five carry-on bags are manageable in a plane, it seems like it would be awkward everywhere else, like in taxis and on subways and whatnot. The more bags we have, the more chance for error. Two big bags are much easier to keep track of than five little ones, even when each boy has been exhorted to manage his own bags. Yes, I realize I’m micromanaging. It’s what I do. Third, am I ready to deal with the restrictions of carry-on luggage? We don’t travel a lot, so I don’t have travel-size anything. I almost lost my 20 year old pocket knife in Mexico when I accidentally forgot it was in my purse and had to pay an extra fee to turn my purse into checked luggage or forfeit it. It just seems more – complicated. Fourth, don’t laugh at me, is that I’m bringing at least one camera body, at least two lenses, and a MacBook – and that’s just me. Hell, that’s one carry-on right there! We’re not overly nomadic, staying in one place in London for a week and then moving to Paris for a second week. And, we have laundry available at both places, so we can pack on the light side and probably fit everyone’s stuff into one or two larger checked bags, which I picture as being vaguely easier to wrangle than five carry-on bags. Who knew this would be harder than planning for a month of travel for one with nothing but a backpack, nearly 20 years ago? Thoughts or advice for a newbie overseas travellers in a large family? We’re deep into the planning of our once-in-a-lifetime trip to London and Paris next summer. We’ve got accomodations, flights and EuroStar tickets booked, and now we’re starting to look at what exactly we want to see and do while we’re there. Of course, on our must-go list for Paris is the Eiffel Tower. I’ve been up it before, when I traveled solo through Europe as a young thing back in 1995, and Beloved and I may or may not have gone up during our honeymoon in 1999. He’s not super fond of heights, though, so it’s possible we enjoyed the splendor from the ground that time. I know at least two of the boys are keen to go up the Tower, though the third is happy to stay with Beloved and keep two feet planted firmly on the ground. And hey, I bet a girl can take a mighty fine photo from those elevated observation decks! But the tickets are not cheap, and not exactly easy to get either. You have to choose your date and time (to the hour) at least three months in advance. An inveterate ENFP, I hate the idea of being pinned down to any particular date or time for anything. What if it’s pouring rain at our booked time? What if we’re doing something else fun that day? 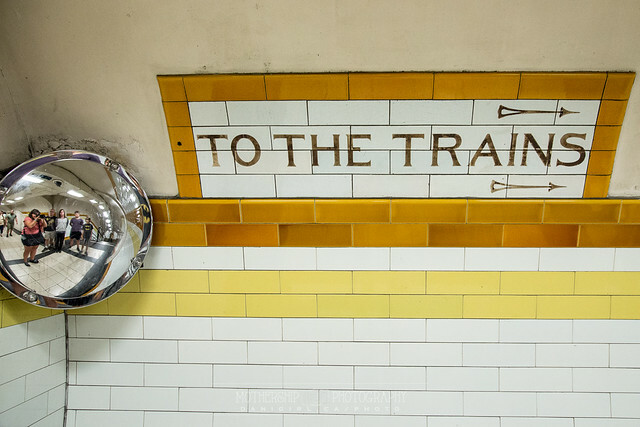 What if we get lost in the subway and miss our booked time, just like I missed my flight home from Paris way back in 1995? I did a little research, though, and one can take the stairs up at a much reduced cost, and with no advance booking required. Rather than €28 for three of us to take the lift to the second level and be tied to a specific date and time, we can pay €17.50 and go whenever our hearts desire. We won’t make it up to the very top for that price, but I’ve heard the views from the second observation deck are just as good, if not better. There’s only one small thing to consider in this plan: 669 steps. It doesn’t sound too dreadful at first, but I started breaking it down. I work in the 17th floor of an office tower. There are 20 steps between each floor, so ground to 17th floor is only 340 steps. By comparison, there are 328 steps to the first floor of the Eiffel Tower, and then another 341 steps to the second floor. That’s TWICE the 17 floors up my office tower, if you’re keeping track. And while I’m reasonably fit, I’ll also be just a few days shy of my 49th birthday. While I imagine the boys will lope up the stairs like the long-legged gazelles they are, I was a little worried about my own stamina. That’s a LOT of steps, in high summer no less. So, I’ve been practicing. Back in January, I started with five floors. I took the elevator down to the 12th floor and made my way up. I added a floor a week, and tried to find the time in each day to walk the stairs at least once. This week, I did my first full 17 flights! Yay, I can now walk comfortably up to the FIRST observation deck of the Eiffel Tower, needing only a couple of minutes to catch my breath. I have just over three months to work on adding that second flight! I promise to share a sweaty, breathless selfie when we make it. 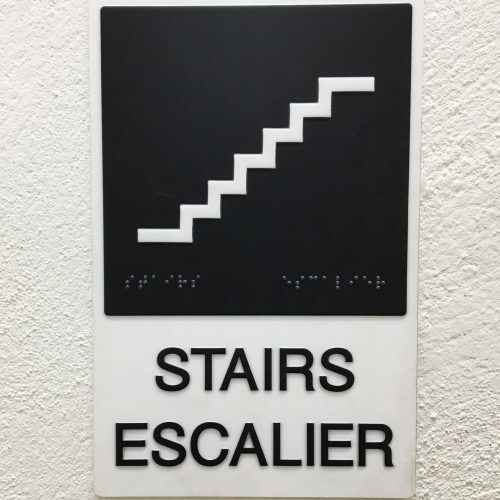 Have you walked up the stairs to the Eiffel Tower, or something similar? How did you do?